DJI has already released a number of great drones, but it is the new Phantom 3 series that everyone is talking about. Most will agree that when compared to the older models, such as Inspire 1, the Phantom 3 drones have shown some significant improvement. Their lightweight, but sturdy construction, as well as reduced size are just some of the advantages that make the new models better than their predecessors. But what about the differences between the Phantom 3 models themselves? They are actually very similar except for a couple of things. 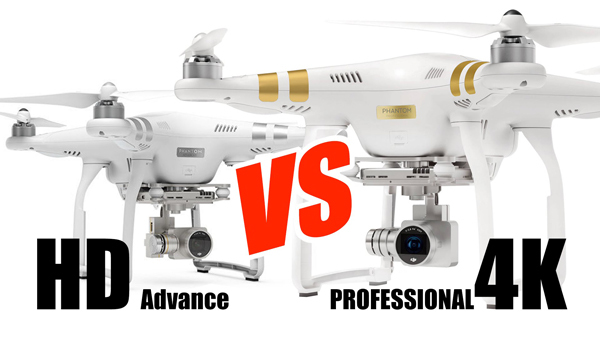 Here we will try to compare the Phantom 3 Professional and Phantom 3 Advanced to see whether there are any significant differences between them. While both Phantom 3 Professional and Phantom 3 Advanced have a 12.0 megapixel camera, they are still two very different pieces of equipment. The Advanced model’s camera is a 2.7K one, capable of shooting at 60 frames per second, which is a lot better performance than that of the stock camera that was used in the production of the Phantom 2 Vision+. It nevertheless fades in comparison with the other model. The Phantom 3 Professional boasts a 4K camera capable of shooting at 30 fps. Such resolution is high enough to be considered ready for big screens and able to satisfy even those looking for professional quality. It is the category in which Professional clearly outperforms Advanced. The second most important difference between the Professional and Advanced models is in the battery charger power and charging time. Both models use DJI Intelligent Batteries that, when fully charged, allow for approximately 23 minutes of flight time. But while the Phantom 3 Advanced features a charger with 57 W power, the Phantom 3 Professional boasts a 100 W charger. This means that the latter takes less time to charge, and is thus more convenient, especially for those who carry their drones with them while travelling. These differences can be significant, especially considering a wide range of purposes one might have in mind when using drones for aerial photography, but they are also the only worth mentioning. When it comes to other important features, such as design and flight performance, Phantom 3 Professional and Phantom 3 Advanced are, in short, two identical drones. * Comparison of charging time between Phantom Advanced (57w) and Professional (100w). Approximate difference: 20 minutes. The Phantom 3 Professional and the Phantom 3 Advanced are both great drones. Although the Professional model clearly takes the lead when it comes to camera and battery properties, it can be tough to choose between them, especially considering the fact that the Advanced is the cheaper one. Since the difference in price, however, is not that big, it might be better to opt for the Professional and higher video quality it provides. We have seen that the two models that make DJI’s new drone series have more similarities than differences. They provide the user with the exact same stability, control and flight performance, but apart from that, they also have two significant differences. Choosing between them will greatly depend on the importance you place on video quality, as well as charging time. Read our DJI 3 Phantom review to learn more about this awesome drone. Next → DJI Phantom 3 vs Inspire 1: Which one to buy?